I recently happened upon a new makeup brand, Medusa's Make-Up. I admit that I have not personally used any of their products yet, but it's evident that they are all about color payoff. Depending on your occupation, I highly doubt that these are products that you would wear to your daily corporate office job, however I do think they have their arena. If you are a makeup artist, this could definitely be a brand worth checking into, then there are always those glammed up nights out on the town to consider! It is said that Medusa's vivid eyeshadows and eye dusts rival L'Oreal HIP products and even give MAC Pigments a run for their money, but they are much more affordable than the latter. Medusa's offers 48 bright, shimmery colors in their eye dusts, priced at $6 for a pot of pigmented powered sugar-like dust (click here for a detailed YouTuber video on dust swatches) and 12 piece pressed shadow collections for $49 (or $8 each). What piqued my interest most about Medusa's is that their natural mineral products are vegan and cruelty free. 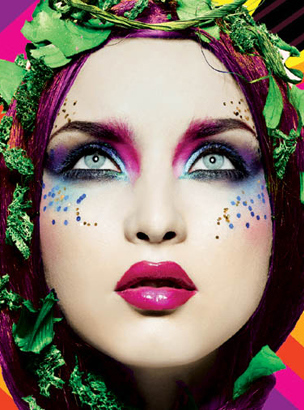 Medusa's offers other items as well, such as high impact color glosses, glitters and body powders. Their site advertises a new Safari color collection which offers shimmery shadows in more muted tones that I'm interested in checking out. I'm also a bit of a gloss junkie, so I'll likely check into those as well. I'll be sure to post a review after I give their products a try! Find out more about Medusa's Make-Up here.